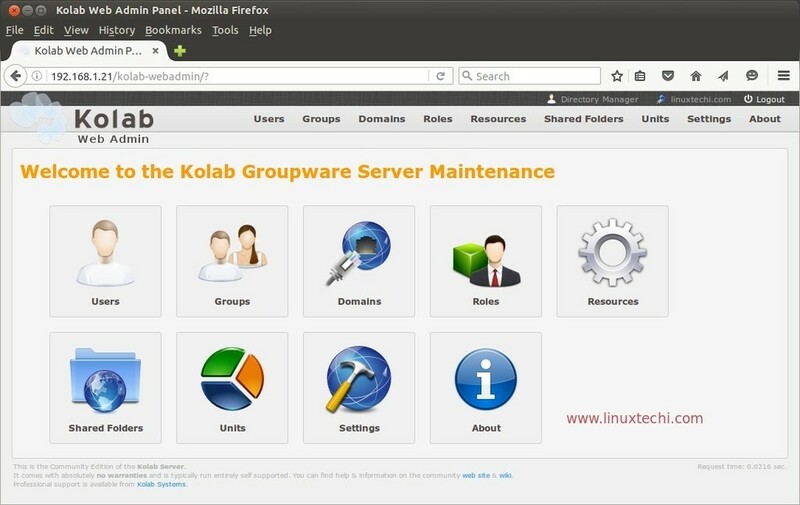 Kolab is a free and Open source groupware software for Unix like operating system. 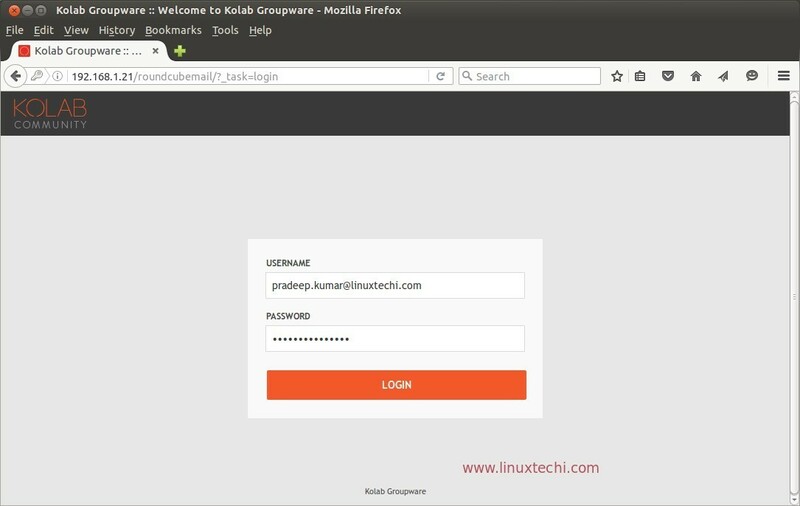 Kolab Groupware provides solution for email server (SMTP), Calender / Events, Address book (LDAP) and more. 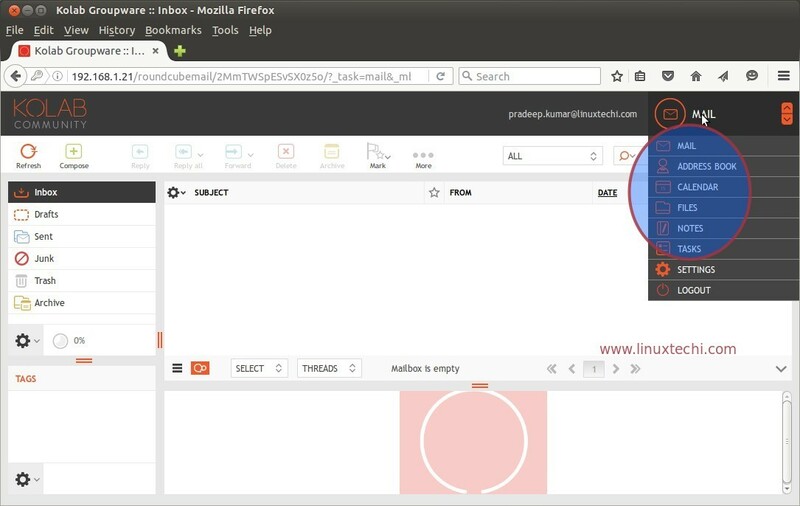 Kolab can be accessed via various clients like Outlook in Windows, KDE (Kontact) in Linux and RoundCube Web Interface. In this article i am going to install kolab 16 Groupware on a single Server (CentOS 7.x / RHEL 7.x ) which will include the services like SMTP, IMAP, LDAP, HTTP and database Server (MariaDB Server). As per the Kolab documentation, Kolab groupware components are not compatible with SELinux, so we will disable it using below commands . Above command will set SELinux in permissive mode temporary, so to disable it permanently, edit its config file ‘ /etc/sysconfig/selinux‘ change the parameter ‘SELINUX=enforcing‘ to ‘SELINUX=disabled‘ and reboot the server. 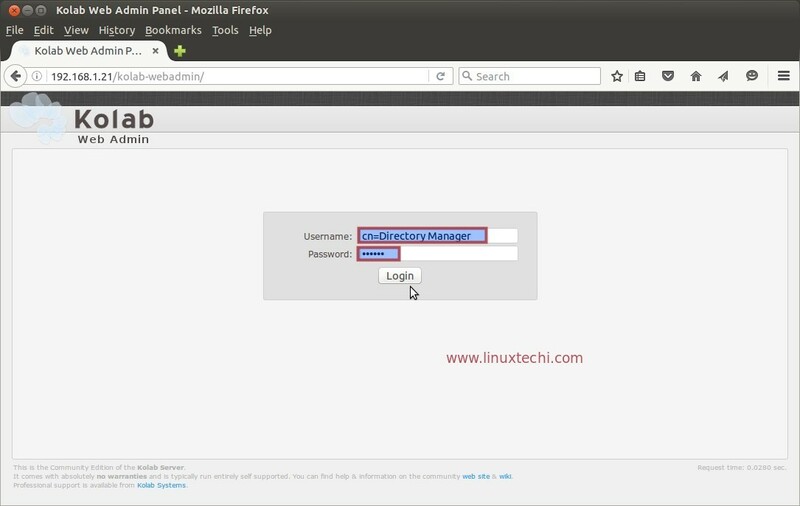 To Set the hostname permanently use hostnamectl command. 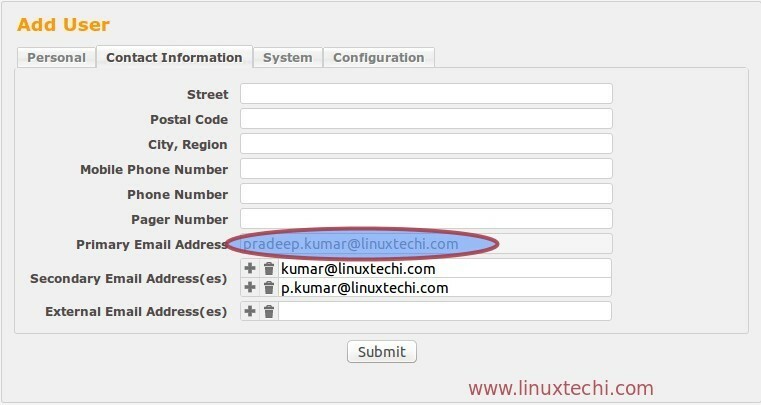 [[email protected] ~]# hostnamectl set-hostname "kollab.linuxtechi.com"
Update the host file in case you don’t have local DNS server. Step:2 Allow Kolab Standard ports in firewall. Use the below commands to allow kolab standart ports in OS firewall. Set the High priority for Kolab repository using below command. Now time to configure Kolab by executing below ‘setup-kolab‘ command and specify LDAP password, domain info and Database password. Job for [email protected] failed because start of the service was attempted too often. See "systemctl status [email protected]" and "journalctl -xe" for details. To force a start use "systemctl reset-failed [email protected]" followed by "systemctl start [email protected]" again. Created symlink from /etc/systemd/system/multi-user.target.wants/mongod.service to /usr/lib/systemd/system/mongod.service. Created symlink from /etc/systemd/system/multi-user.target.wants/manticore.service to /usr/lib/systemd/system/manticore.service. Replace the IP or Hostname as per your setup. Use user name as ‘cn=Directory Manager‘ and password that we set in above step. Now Let’s try to create a mail user from admin Panel. 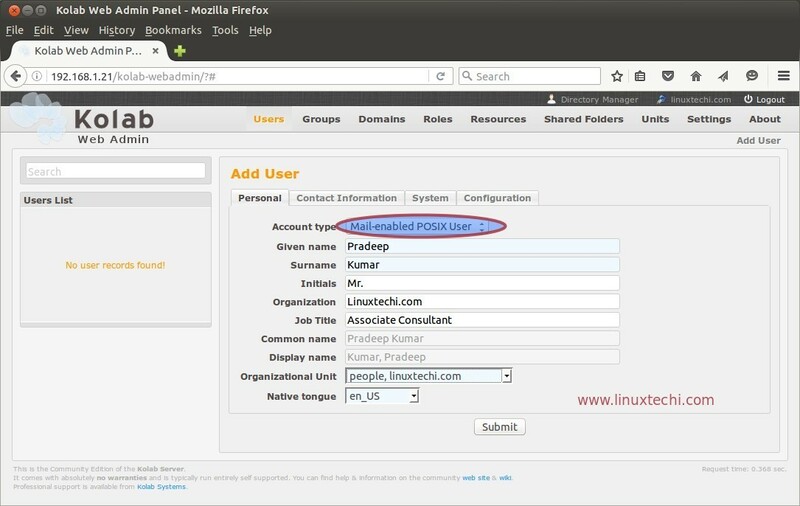 Click on Users Icon in web Admin Panel. From the Contact Tab, verify the email address of the user. From the System Tab, we can get the password for the user and also we can generate new password as well. From the Configuration Tab we can set the email Quota for the User. 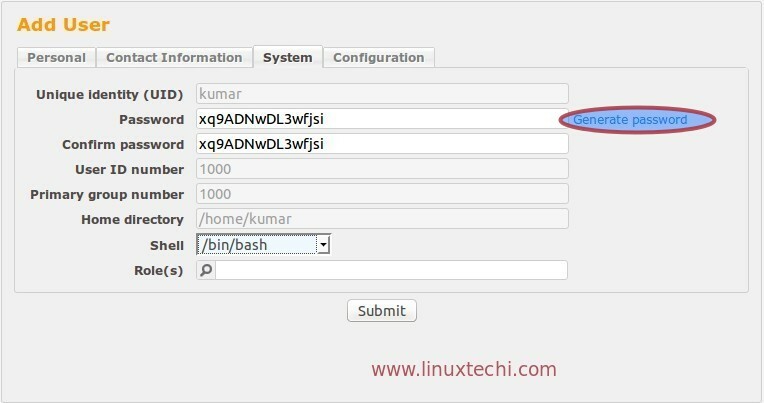 Once you are done with all the configuration , click on Submit to create user. Use the below URL to access the Kolab Roundcube Webmail. Use the user name as Primary email id, in my case user name is ‘[email protected]’ and password that we set while creating user. As we see that from the Roundcube webmail we can access the mail, address book, calenders and tasks. How to add email group and email alias ?